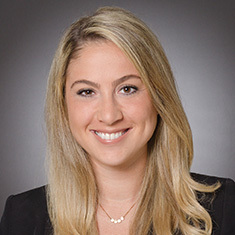 Alexandra R. Caleca concentrates her practice on securing, protecting and enforcing rights in the trademark area for companies of all sizes, including in the management of global trademark portfolios. While much of her practice has involved clients primarily in the fashion and apparel, consumer goods, and luxury industries, she has worked on projects involving a variety of industries. She focuses on worldwide branding strategies and protection and enforcement of intellectual property rights, including trademark clearance, prosecution, registration, opposition and cancellation actions, policing, infringement, and anti-counterfeiting. She also advises clients in drafting licensing, assignment, settlement and co-existence agreements. Alexandra also has handled projects involving copyright and advertising issues. Before law school, Alexandra gained legal and business experience as both a paralegal and later as a legal intern for a global fashion company. During law school, Alexandra served as the president of the Intellectual Property Law Association, founder and chair of the Fashion Law Committee, and notes and comments editor of the Brooklyn Journal of International Law. She also was a fellow at Brooklyn Law School’s Trade Secrets Institute and interned for various leading luxury goods companies. Shown below is a selection of Alexandra’s engagements.